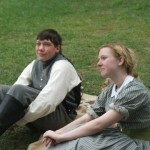 Despite a weekend of scattered showers, the Harrison County Civil War Sesquicentennial 150th Anniversary went off with hardly a hitch May 13 -15th. 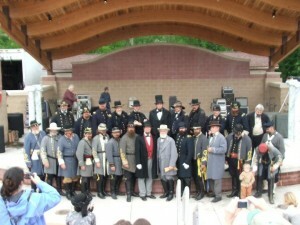 Funded by the state and sponsored by local historical societies and business as the kick off event for West Virginiaâ€™s 150th celebrations and reenactments it was a full two years in the planning and organizing. Free to the public and held at Veterans Park next to the Veteransâ€™ Hospital and Nursing Home complex, it provided a total immersion presentation for the public with everything from “Meet the Generals” presentations by the two premier living history groups Federal Generals Corps and Leeâ€™s Lieutenants, to field hospital demos, civilian life, cannon firing, military drill and a debate between Lincoln and Davis over the causes of the Civil War and on Sunday a period church service. Other attractions included a Saturday night fireworks show, hot air balloon rides, horse drawn carriage rides, plenty of food concessions, and concerts. 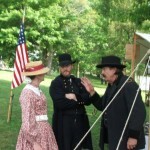 The public was free to roam through the camps to talk with both reenactors and living historians about Civil War history for which we stayed in character. 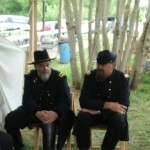 Rick Byrd (as Gen. George Crook) and I (as Gen. William Averell) shared my tent and set up on Thursday evening and helped others set up on Friday. After supper at the local burger place Thursday night we had a violent storm that lasted several hours but the tent withstood it with no problem as we were camped among trees on a lower side of a hill in a flat spot. It took me awhile to get to sleep watching the light show on the canvas roof hoping the lightning would not hit. Spotty showers haunted the event, but we did get some sun and no wet canvas was packed on Sunday after the event. The major series of storms passed north of us. Still, with all the spotty showers, Rick got to fly his Army of West Virginia flag, made by Jim Openaker (Gen. Sherman) noting it was the first time it flew in the area since the war. 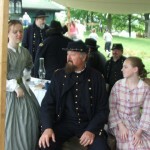 The centerpiece of the event were the living historians of both the Federal Generals Corps and Leeâ€™s Lieutenants and we were treated like royalty as far as food was concerned. We all swear we gained weight by the end of the event from a dinner on Friday night with the local dignitaries and sponsors, lunch and Bar-B-Que on Saturday evening. Besides our regular schedule we also participated in a saber arch for a wedding and were invited to visit the hospital and nursing home on Sunday morning so the veterans who could not walk to the event next door could meet the generals. We thanked them for their service and they totally enjoyed themselves amazed at the accuracy of our military uniforms and how real we made history for them. 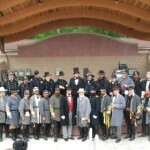 All in all it was a great event for participants and public and we all agreed that it would go on our schedule if repeated in 2012. 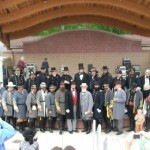 Barry Meadows (Gen. U. S. Grant) provided the photos below. 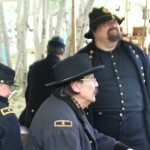 I would love to network with you and other reenactors. 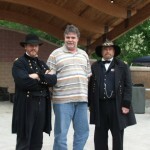 We are building steam for a traveling RV caravan/rally to various different reenactment sites over the next 4 years.